1. What is the United Nations Declaration on the Rights of Indigenous Peoples? The United Nations Declaration on the Rights of Indigenous Peoples is an international human rights instrument adopted by the UN General Assembly in 2007 after more than two decades of negotiations with representatives of Indigenous Peoples and States. The UN Declaration articulates “the minimum standards for the survival, dignity and well-being of the indigenous peoples of the world.” (Article 43)The UN Declaration applies to the 370 million Indigenous people around the world. In May 2016, the Hon. Carolyn Bennett, Minister of Indigenous and Northern Affairs, announced that “Canada is now a full supporter of the Declaration, without qualification.” Minister Bennett affirmed Canada’s commitment to adopt and implement the UN Declaration. On February 22, 2017, the Government of Canada announced the creation of a Working Group of Ministers that will examine relevant federal laws, policies and operational practices to help ensure the Crown is meeting its constitutional obligations with respect to Aboriginal and treaty rights; adhering to international human rights standards, including the UN Declaration; and supporting the implementation of the TRC’s Calls to Action. This Working Group will work with Indigenous leaders, youth and experts on various legal and policy issues. 2. Does the UN Declaration give Indigenous Peoples new rights? The UN Declaration does not create new rights for Indigenous Peoples. It affirms Indigenous Peoples’ inherent, or pre-existing, collective human rights, as well as the individual human rights of Indigenous women, men and children. It applies existing human rights standards to the specific historical, cultural and social circumstances of Indigenous Peoples. While it does not automatically change Canadian laws, courts are free to rely on declarations and are using them in interpreting human rights – as are Indigenous and non-Indigenous governments and human rights bodies. One recent example is the Canadian Human Rights Tribunal ruling on child welfare. The UN Declaration is an authoritative instrument to clarify, interpret and expand the meaning and scope of domestic laws. 3. What is the benefit of a legislative framework? 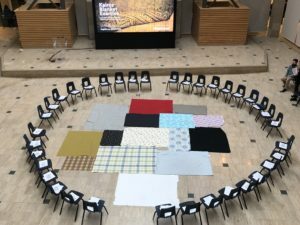 A legislative framework for implementing the UN Declaration would affirm its central significance in the process of reconciliation, as called for by the Truth and Reconciliation Commission of Canada (TRC). Bill C-262 is a Private Member’s bill that sets out a comprehensive legislative framework and seeks to ensure that the laws of Canada are in harmony with the UN Declaration. The bill, currently before the Senate of Canada, sets out the key principles that must guide implementation of the UN Declaration. It directs the Government of Canada to work with Indigenous Peoples to develop a national action plan to implement the UN Declaration over a 20-year period, and requires annual reporting to Parliament on progress made toward implementation. 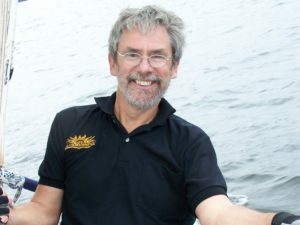 Since bringing Canadian laws and policies into conformity with the UN Declaration will require many years of work, the 20-year commitment that would be established by Bill C-262 is important for ensuring that a legislative framework is in place beyond the term of the current government. 4. How will the UN Declaration help mend the relationship between Indigenous Peoples and Settlers? The TRC calls the UN Declaration a framework for reconciliation and is “convinced that the UN Declaration provides the necessary principles, norms, and standards for reconciliation to flourish in twenty-first century Canada.” Of the TRC’s 94 Calls to Action, no less than 16 lift up the UN Declaration, summoning governments, churches, businesses, law societies, and many more institutions to learn, adopt, comply with and/or implement its minimum standards. In other words, if we desire the health, dignity, and well-being of both Indigenous people and settlers, implementing the UN Declaration is a critical way forward. The UN Declaration can be considered a blueprint for justice, reconciliation, healing and peace. Throughout history, Indigenous Peoples’ human rights have repeatedly been denied and violated – the direct cause of the broken relationship. To create a better future, Indigenous Peoples’ human rights must be respected, promoted, and protected. 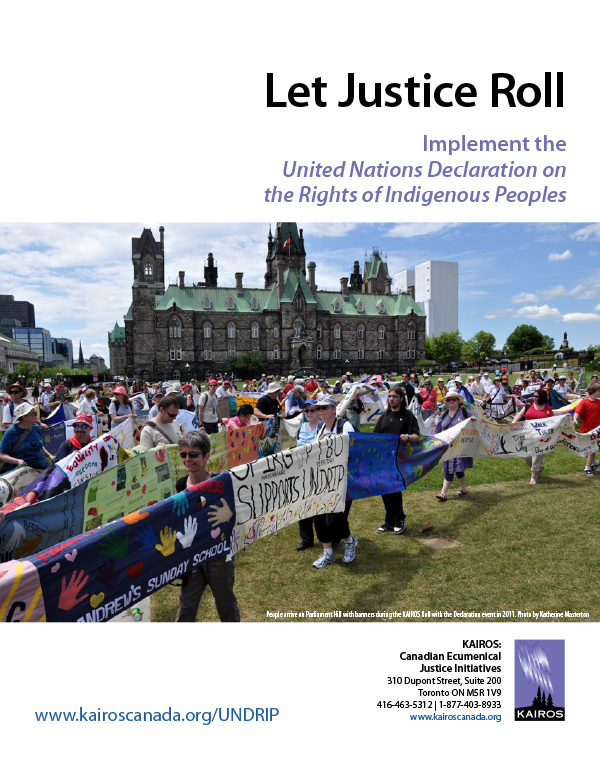 The UN Declaration is an essential tool for governments, institutions and leaders to work in cooperation with Indigenous Peoples to change the existing paradigm, reject colonialism, and ensure Indigenous Peoples’ rights are honoured without discrimination. 5. A key right lifted up in the UN Declaration is free, prior and informed consent (FPIC). What does it mean? 6. What does it mean for churches to affirm the rights of Indigenous Peoples to their spiritual traditions? Article 12 in the UN Declaration affirms that Indigenous Peoples have the right to manifest, practise, develop and teach their spiritual and religious traditions, customs and ceremonies; the right to maintain, protect, and have access in privacy to their religious and cultural sites; the right to the use and control of their ceremonial objects; and the right to the repatriation of their human remains. Many Christians can affirm respect for other faith traditions based on a gracious living out of Jesus’ teaching to do to others as you would have them do to you. (Luke 6:31) Many Christians stand in wonder at how the God of all nations has created diverse and wonderful peoples. Respect for each other’s spiritual traditions opens up the possibility of rich dialogue on the meaning of faith and on how spirituality provides strength to face life’s many challenges, including healing, reconciliation, justice and peace. Respecting rights can include sharing faith, but not imposing one’s faith. In the not so distant past, the Government of Canada criminalized spiritual ceremonies such as the Sundance and Potlatch, and used Indian Residential Schools to aggressively indoctrinate cultural and spiritual beliefs in order to assimilate Indigenous children. The Rt. Hon. Beverley McLachlin, former Chief Justice of the Supreme Court of Canada, characterized the Residential Schools System as cultural genocide. Violating the rights of Indigenous Peoples to their spiritual traditions is part of the colonial legacy. Some but not all denominations have repented for this past behaviour. The right to practice spiritual traditions is an inherent right and is essential to the process of reconciliation, and for the dignity and survival of Indigenous Peoples. 7. Will implementing the UN Declaration be difficult? Yes. The legacy of colonialism is deep and painful. Reconciliation is hard work: emotionally, mentally, physically, socially and spiritually. 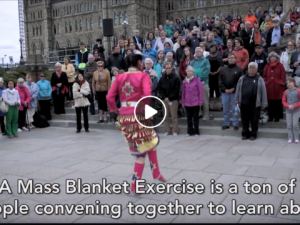 Non-Indigenous Canadians are encouraged to learn the common history shared with Indigenous Peoples, and spend time building relationships with Indigenous Peoples. As people of faith, we will have our assumptions challenged and be forced to face our fears. It takes courage to offer your voice and your action to the work of reconciliation, justice and peace-making. At the same time, the gifts of forgiveness, healing, and hope are rooted in God’s promise to be with us and to guide us. The work of implementing the UN Declaration will also be joyful and uplifting – knowing that the rights of all are being respected. 3 S.C.R. 511 is the leading decision of the Supreme Court of Canada on the Crown’s duty to consult Aboriginal groups prior to exploiting lands to which they may have claims.